Chamaedorea elegans ‘Neanthe Bella’ is a small species of rainforest palm native to Mexico and Guatemala.Its common name is the Parlour Palm. Because it is slow-growing, it is highly suitable for use as a tropical office plant or house plant. In its natural environment, it grows to about 9-10ft in height. It is cultivated for sale to interior landscapers most often as a table-top size plant of 6-12 inches, or occasionally as a small floor plant, no taller than 2 ft. It is an elegant, very full palm with small leaves that grow on graceful fronds. This plant does best in bright indirect light; too much sunlight will cause the leaves to burn and lose their colour. It also prefers a humid environment. In dry conditions, such as a heated home or office in the winter, the ends of the leaves will turn brown. Hot dry conditions will also make the plant prone to spider mites. Regular cleaning of the foliage with a wet cloth or sponge will deter the insects. The Parlour Palm prefers a well drained loamy soil. Allow the top inch of soil to dry out before giving it a thorough watering. Regular fertilizing with a good quality tropical plant fertilizer is important. Fertilize once per month from February though November. In addition to using this palm as a single specimen plant, try it in a mixed tropical arrangement. It can add height and interest, and mixes well with other tropical plants as it can tolerate a fairly wide range of conditions. Not enough light for this palm? 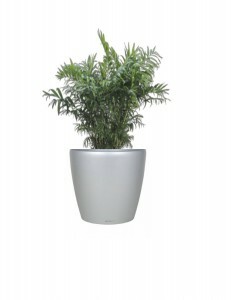 Consider purchasing an artificial version of this plant. High quality, lifelike artificial Parlour palms are available for use in your home or office plantscape.